Very little is known about Francis. We don't know where he came from, whether he has any surviving family, or even if he is a boy or a girl. 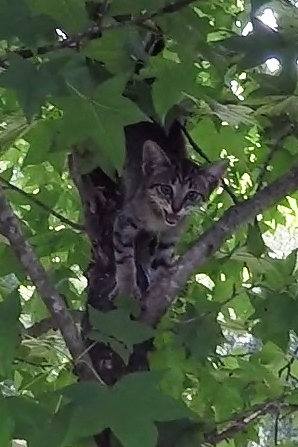 All we know is that he is a feral kitten who got stuck in a tree, and he was not happy about it. He lived in a rough environment, so he could have been chased up the tree by a dog, coyote or even one of the mean cats known to be in the area. Whatever his story, it was both short and unpleasant. Lucky for him, though, that a very kind teenager lived there, heard his cries, and had the heart and initiative to do something good for him. I was told that he was somewhat tame in that he was not uncomfortable around people, but he was not especially friendly with them either. When I arrived and heard him calling longingly at the people below, I felt like he could be a cooperative kitten and an easy rescue. He was near the end of a long branch, but I watched as he walked all the way back to the trunk. If he could do that, then I should be able to lure him close to me and rescue him pretty easily. The tree, unfortunately, was a tangled mess of excessive and obstructive limbs and foliage that obscured my view and access. The only branch I could tie-in to was the kitten's branch. So I pulled myself up to that point and began to lure the kitten closer. Unfortunately, he was more cautious of me than I had hoped. It took a long time for him to get comfortable enough with me to venture closer. I held out food for him, and he desperately wanted it, but his fear of me kept holding him back. He eventually did manage to eat from the bowl in my outstretched hand, but I was in a very uncomfortable position and could not hold it very long. Francis withdrew, and I knew I had to climb higher to get in a better position. Unfortunately for me, however, the only way I could climb higher was to 'pole-climb' the trunk of the tree at that point. That is a painfully slow and strenuous method of climbing, but once I reached a point where I could tie-in to a large branch, I was in a much better position to come back down to the kitten's branch and get closer to him. No matter how hard I tried, I could not get Francis to come close to me again. He stayed well out of reach, so I finally gave up and called for my rescue-pole. I reached the pole out to him and had several opportunities to get the noose around him in the correct position behind his front legs, but each time I could not tighten the noose around his tiny body quickly enough. Each time he walked out of it. Eventually, however, I did get him just right and pulled him close to me and safely into the net. After I came down, I placed him in a carrier with a bowl of food and water. He ate it readily and seemed relieved to be down. He eventually settled down and was very quiet. The residents there did not want to keep the kitten, and releasing him back into a hostile environment did not seem like a wise thing to do either, especially since he was not neutered. The residents asked me to take him to the local Companion Animal Alliance office which is striving to be a no-kill shelter. They have made admirable progress toward that goal but are not there yet. It is unclear what will happen to this kitten here, but at least he has a chance here that he would not likely have if released where we found him. I have felt very sad about leaving the kitten there, but my hope is that someone will adopt him. The only video that I have of this rescue is of my first attempt to lure him close to me. When I began climbing higher, I turned the camera off because that part would be boring and would take a long time. When I returned to rescuing the kitten, I forgot to turn the camera back on. 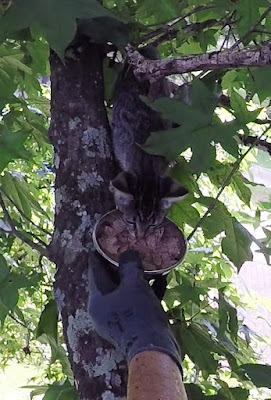 I am sorry that this video is missing the most interesting part of the rescue, but it is still worth a look to see this very cute kitten as he struggled with the competing urges of hunger and fear.